Laron, Inc. would like to congratulate and recognize three new graduates of the Laron, Inc. Apprenticeship program. Laron, Inc. has done its part to help mold future generations of problem solvers to Keep Industry In Motion™. Each have received certifications marking the conclusion of a four-year program that required each Apprentice spend more than 8,000 hours a piece for on the job learning of their trade and additional hours in the classroom. The program was designed by John Hansen, COO and Glenn Thoroughman, CEO of Laron. The apprentice training area is a fully equipped machine shop dedicated to apprentice training to allow the apprentice to practice and improve their skills in the safety of a training environment. Laron Inc. also has a dedicated classroom and a computer lab instructed by George, who puts all of the Apprentice thru rigorous classwork and testing. The apprentices did some of the work not only in the shop, but also in the field, demonstrating their full abilities in an evolving world. 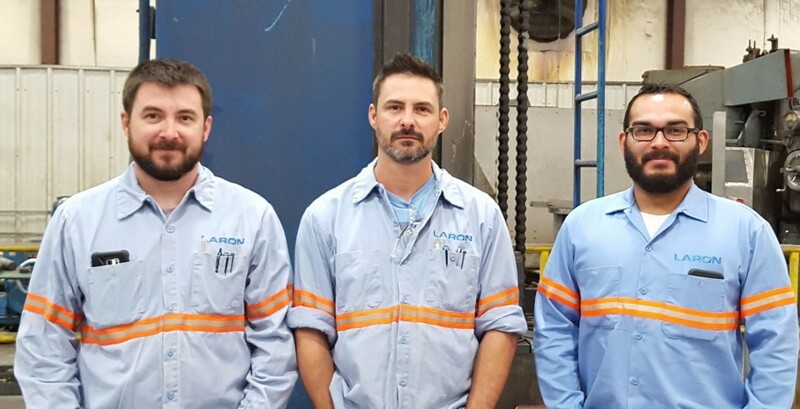 This direct access to real-world problems provides the perfect platform to test their abilities as the journeymen they have become, as well as establish the safety and quality that Laron provides company wide. Laron Apprentice Machinists received a pair of certificates, one from the State of Arizona and the other from the Department of Labor, each recognizing them as journeymen in their craft in addition to a journeyman machinist card. Laron Chief Operating Officer John Hansen also handed each man a Morgan silver dollar dating from the 1880’s to the 1920’s to commemorate their accomplishment. Laron Looks forward to each Journeyman’s continued success within the company as well as their daily lives. Laron is Headquarted in the Kingman Airport Industrial Park at 4255 Santa Fe Drive, Kingman AZ. Laron, Inc. currently employs over 200 people, with branches in Phoenix, Tucson and Salt Lake City.